What a crazy/ busy/ exhausting first few weeks of school! I was so worn out by 4PM on Friday of the first week that I sat down on the couch after the last kid wandered in off her school bus, and I promptly fell asleep for close to two hours. Right in the middle of all of the kids and all of the chaos. Granted that I had donated three full bags of platelets at Atlanta Blood Services that morning, but that just pushed me over the edge. And even after my glorious nap, I went to bed by 9PM. I think I need to get a little tougher if I’m going to make it through this school year intact. There’s way too much stuff coming up and happening for us right now! Kid E started kindergarten a few weeks ago. He is settling in nicely, making new friends and learning all of the mundane rules that he will have to follow every school year from here on out. He has already determined that recess and P.E. are “the only good parts of school,” so we have very high hopes for his educational prospects. He also started playing baseball and, after a rough first day (it turns out he had croup, thus the meltdown at practice), he seems to have settled in nicely. Kid C has been dancing en pointe for a few months now and is doing really well. She has learned how to pad-up and tape all of her vast and varied foot and toe injuries, and she has grown accustomed to blood and blisters as a part of her everyday life. She is looking forward to auditioning for a role in The Snow Queen in just a few weeks. Kid B is adjusting to high school after a rough academic start. Her class load is really tough one, so she has to work really hard to keep up. It wasn’t like that for her in middle school, so she has had to figure some stuff out. But she just sucked it up and did it, which is awesome. She also just started soccer season and is tearing it up. This weekend her team is playing in the Atlanta Cup Tournament and they had three shut-outs before losing a penalty kick-only semi-final 4 – 2. They have gotten really aggressive on offense and Kid B continues to train hard, make great saves, and be an all-around badass. On Friday, Kid D got to have the experience of a lifetime. My brother-in-law is Somebody Important and he knows how much that boy loves baseball. He set it up so Kid D went down onto Turner Field just before the Marlins v. Braves game and make the announcement over the P.A. and on the Jumbotron… “It’s time for Braves baseball… Let’s PLAY BALL!” He did a fantastic job and he is still beaming about it. He looks forward to Quick Pitch and Sports Center playing this clip over and over once he gets drafted by the Braves to actually play ball sometime around 2030 or so. Kid A is enjoying her final year of high school very much… especially all of the perks that come with being a senior. She is in the process of completing the common application for colleges, and soon she will fine tune other submissions for a few early admissions, and then even more for regular deadlines. She is also still dancing ballet and is looking forward to The Snow Queen auditions. Sheepdog just jumped out a plane for the first (but definitely not the last) time. He went up with a group of friends on a beautiful Georgia summer day, and experienced the amazing rush of flying in free fall. Be prepared to watch the video of his leap from 14,000 feet anytime you step foot into our living room, at least for the next few weeks or so. Today, I am leaving, along with both of my parents, two of my sisters (the third is too pregnant to travel), Kid A (who took Sister D’s spot when she got herself knocked up), three aunts, two uncles, and a handful of family friends, for Barcelona, Spain. 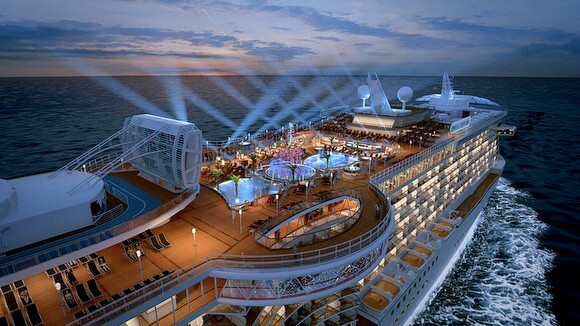 From there, we get on board the Royal Princess for 12 days of travel around the Mediterranean Sea. We have stops planned in France (Toulon/ Provence), Italy (Florence/ Pisa, Rome, and Naples), Greece (Mykonos), and Turkey (Istanbul and Kusadasi). Then we travel back, pulling into port in Greece (Athens) and finally, Italy (Venice). If you look closely, you can see me on the Lido Deck, sunbathing with a drink in hand. I have been pretty busy getting the family adjusted to the new school and sports schedules and we are just settling in to the routines. Now, I’m going to go and screw everything up by leaving Sheepdog to run the show, single-parent style, all while taking the oldest kid (and third driver) away with me for a total of 15 days. Oh yeah, and he still has that thing called a full-time J-O-B, too. It’s a very good thing that Sheepdog’s parents are coming to Atlanta to help him out. I have only been on one other cruise in my lifetime, when I was four or five months pregnant with Kid D. I went with my mom and all three of my sisters. It is always fun to be with them, but I didn’t love the cruising part of it as much. Yet, when my mom and dad proposed this “Trip of a Lifetime,” with all of the amazing destinations on the itinerary, I couldn’t pack my suitcase fast enough. I have never been to Europe, so I am buzzing with excitement and enthusiasm for the experiences that lie ahead. Here’s to some amazing things that just happened and even more things on deck. This entry was posted in family, kids, school, sports, travel and tagged ballet, baseball, college applications, cruise, family update, high school, kindergarten, Princess Cruises, Royal Princess, skydiving, soccer. Bookmark the permalink.